I trolled my local farmers market today not really looking to buy jewelry, but as I was leaving I somehow wandered (wink wink) into the vintage jewelry stand. I am glad I did because I found a darling nautical themed bracelet. Always coming back into style each spring/summer, one can easily go overboard when doing the nautical trend if not edited carefully. Beware of doing head-to-toe nautical, sporting a tri-colored, striped outfit complete with some ferry top-siders. When I do the nautical trend I let one outfit piece do the talking or choose only one aspect of the theme like JUST stripes. 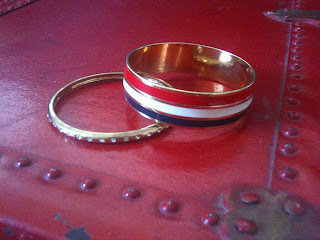 Spotting this vintage chunky nautical bangle I had to have it. Not only was it striped but it was three toned with red, white and blue. Almost like putting three signature Kate Spade bangles together, my favorite detail is that each color is separated by a gold outline. Take note! A bracelet such as this one is in of itself nautical overload. Thus don't forget to keep it simple. If you want to be a bit more daring, stack it with some gold bangles.